Obviously this is just to reconfirm that the pH is indeed 4. The full review is available on the blog. No SLS. Not available in Indonesia. I bought mine from Eri’s lapak at Female Daily Market Plaza for around IDR 345,000 (depending on exchange rate). Why Sunday Riley Ceramic Slip Move Up in its Position on my Cleanser List. For the longest time, I have been telling people that there are plenty of cleansers out there that you need to try out first before you reach out for Sunday Riley Ceramic Cleanser. I hate the fact that everything from Sunday Riley is ridiculously overpriced and seems to be marketed to be a breakthrough in the market. Where in fact, I’ve seen similar product before. There’s nothing new. But her PR and Marketing people are so good that it’s everywhere and it’s the brand to have! Considering that the price of this cleanser is USD 45 (before tax!) is not exactly cheap. Of course, this is also the time where I’ve found out that Sum37 Miracle Rose Cleansing Stick is as lush as what people said. Fancl Washing Powder is just as mild and great. So what’s the fuss really! I’ll tell you why I’ve changed my mind and why it’s definitely an ok thing for you to get this cleanser. It’s so worth the splurge! Clarins White Plus Pearl-to-Cream Brightening Cleanser contains a pleasant texture and a high performance formula, helping to prevent and reduce pigmentation whilst leaving your skin feeling soft and refreshed. This foaming cream cocoons the skin in softness, leaving it perfectly clean, fresh, soothed and flawless. It will eliminate all traces of impurites and pollution while respecting the hydrolipidic film. This cleanser will also progressively unifies and brightens the complexion thanks to alchemilla extract, which restores the skin’s natural, fresh, rosey aspect. Perfect for combination skin and use in hot climates. Also a great way to remove all traces of make-up without damaging the outer layer of the skin. 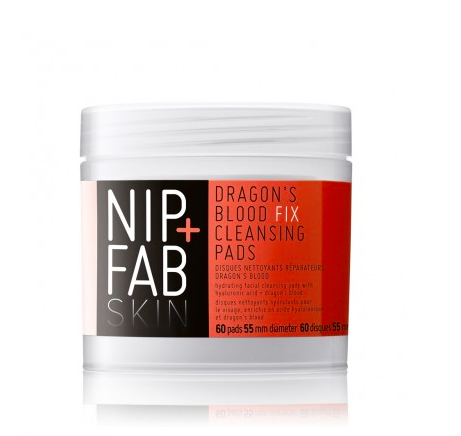 Refresh and smooth your skin with our gentle cleansing Dragon’s Blood Fix pads. Each of the 60 pads are enriched with salicylic and hyaluronic acids which deeply cleanse your pores and provide long-lasting hydration to help your skin appear plumper. The witch hazel helps reduce the appearance of imperfections, leaving your complexion looking smoother and refreshed.